William, Wild Bill, Guarnere and Edward, Babe, Heffron were among the first paratroopers of the U.S. Army members of an elite unit of the 101st Airborne Division called Easy Company. The crack unit was called upon for every high-risk operation of the war, including D-Day, Operation Market Garden in Holland, the Battle of the Bulge, and the capture of Hitler’s Eagle’s Nest in Berchtesgaden. Both men fought side by side until Guarnere lost his leg in the Battle of the Bulge and was sent home. Heffron went on to liberate concentration camps and take Hitler’s Eagle’s Nest hideout. United by their experience, they reconnected at the war’s end and have been best friends ever since. Their story is a tribute to the lasting bond forged between comrades in arms and to all those who fought for freedom. This was a good World War II story. 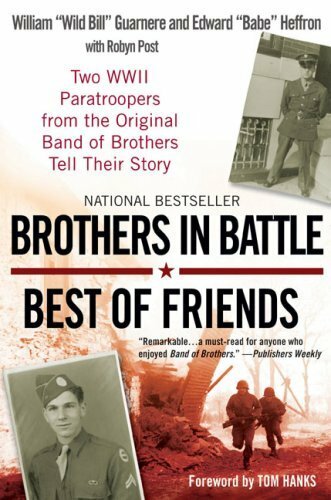 I read Band of Brothers and really enjoyed it. When I saw that this book was about two of the paratroopers from Band of Brothers, I knew I wanted to read it. I picked this book up shortly after I had finished the book Band of Brothers, but had not gotten around to reading it until now. It is a good story that has many tales about the paratroopers lives. It is a war book with graphic descriptions and language. I loved reading about the personal experiences of William Guarnere and Babe Heffron. These were remarkable men who endured much during that World War II and became great friends during and after the war.